Small businesses that want to compete with big retailers such as Amazon by providing fast delivery to their customers now have an opportunity to do so. 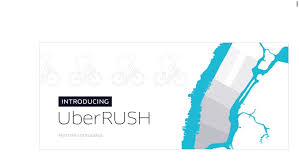 Uber (the guys launched the taxi service app) now have an app called UberRUSH that lets retailers provide fast delivery to their customers. When your small business sign up for the service your customers can use the app to order items from your store and get it delivered immediately. As a retailer you will be charged a fee and the customer also gets charged a fee. The fee consists of a $4 base fare + $5 per mile + $1 to the Bike Messenger Emergency Fund. Retailers only pay for deliveries made. There are no roundtrip charges. Hence, you can expand your delivery zone with this service. Messengers who sign up to the service to make money doing deliveries have to meet stringent requirments. In order to be an UberRUSH partner, individuals must pass a stringent background check; an in-person interview and screening and ongoing quality controls. The UberRUSH service uses Bike and Foot Messengers to pickup and deliver products. Hence, large and over sized products will not be picked up and delivered. The service allows retailers and customers to track the delivery in real-time. The UberRUSH service also integrates with other platforms such as Shopify and Clover. Companies such as 1-800-Flowers, ChowNow and Bigcommerce are already using the service. The only drawback at the moment is the fact that the program is being tested in only three cities, New York City, Chicago and San Francisco. Entrepreneurs interested in enhancing their business with a delivery service should regularly visit the Uber website to get updates on when it will be coming to their cities.